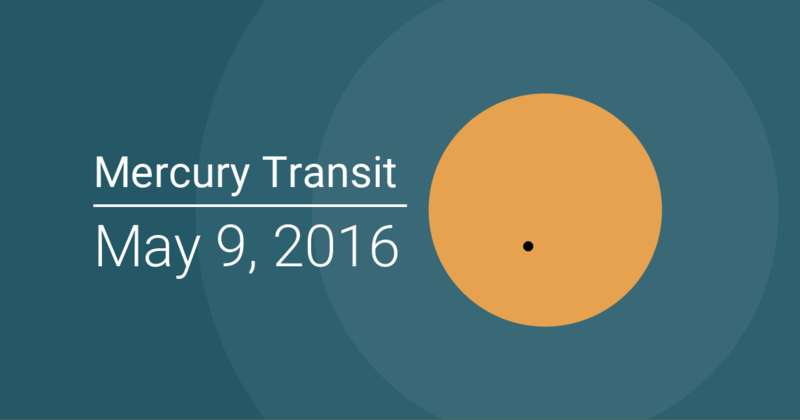 What Does Transit Of Mercury Means? Mercury is a physically small planet, only three thousand miles in diameter, compared to Earth’s almost eight thousand. During the transit, Mercury will be visible as a tiny dot near the Sun’s northern edge. The planet will be ten seconds of arc in diameter, only one-half of one percent of the solar disc. This tiny size will require substantial magnification to see the Mercury’s disc against the Sun. A two-inch-diameter telescope is probably the minimum required to see the transit. Both our Earth and Mercury are moving in the same direction, counterclockwise as viewed downward from the north. Mercury is in an orbit that is much closer to the Sun, so it moves faster. From our viewpoint, speedy Mercury will approach the Sun from its west side. But Mercury and the Earth are not quite in the same orbital plane. The orbit of Mercury is tilted seven degrees from that of the Earth. This tilt usually takes Mercury above or below the Sun as seen from the Earth. But there are two times a year that if Mercury happens to pass the Sun, it will crosses in front of the Sun. One of these times is around May 8, the other around November 10. If the transit occurs on either of these dates, Mercury will travel across the center of the Sun’s disc. The longer before or after those dates that a transit occurs, the farther Mercury will be from the center of the Sun. Our November 15 event will occur just at the end of the November transit “window”. As such, Mercury will be very near the north edge of the Sun during the transit. If Mercury had taken a day longer to pass the Sun, there would not be a transit at all. The last transit of Mercury occurred on November 15, 1999. It was not visible from Europe The last visible of transit from Europe occurred on November 10, 1973. Here i have given the regions of visibility and invisibility of the May 9 transit. The cloud dataset is extracted from polar-satellite images acquired between 1982 and 2009 and compiled as part of the Patmos-x project. 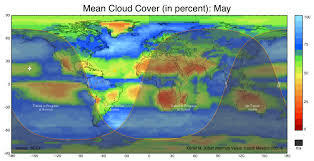 “Cloud” is a difficult parameter to measure, as it can be thin or thick, water or ice, and often composed of elements too small to register in the satellite image. The determination of whether a scene is cloudy or not is a process that is fraught with measurement biases, and so the map below should be used as an indication of the relative cloudiness of a region rather than the absolute probability of seeing the transit. In North America, the best weather occurs over the southwestern deserts of the USA and adjoining parts of coastal Mexico. Sunshine favours the Mediterranean coast of Europe and both the northern and southern thirds of Africa, though only the western Sahara is located to see the entire transit. It should come as no surprise that all of the best-situated regions are near or within the Earth’s great deserts, except for the cloud-free weather atop the Greenland icecap. In addition to the telescope, you will need a full-aperture solar filter. This is a filter that reduces the brightness of the Sun by a factor of 10,000. They are placed over the front of telescope, covering the entire front aperture. This keeps the Sun’s heat from even entering the telescope. If you have a small filter that goes over the eyepiece, throw it out: the Sun’s heat could potentially crack the filter while you are looking through it. This would allow the full heat of the Sun, concentrated by the telescope and eyepiece to reach your eye. You will suffer extensive eye damage, so only use the full-aperture solar filter or do not look at the Transit. There will not be another transit of Mercury visible from western North America until 2016, so don’t miss this one! Eastern 4:11 p.m. 4:22 p.m. 4:41 p.m. 4:58 p.m. 5:10 p.m.
Central 3:11 p.m. 3:22 p.m. 3:41 p.m. 3:59 p.m. 4:10 p.m.
Mountain 2:11 p.m. 2:23 p.m. 2:41 p.m. 2:59 p.m. 3:10 p.m.
Pacific 1:12 p.m. 1:23 p.m. 1:41 p.m. 1:59 p.m. 2:10 p.m.
Alaskan 12:12 p.m. 12:23 p.m. 12:41 p.m. 12:59 p.m. 1:11 p.m.
Of course, the weather forecast for the day will provide much more usable predictions for the event.